Foreclosures are bewildering and terrifying for most homeowners. Some people naively sit by, believing they will get a workable loan modification from their loan servicer, until it’s too late to escape the dilemma. Others suffer a worse fate and, in their confusion and desperation, become easy targets for unscrupulous scam artists. Scam artists, preying on foreclosing homeowners, claim guaranteed results. No honest person would ever make that guarantee, as no foreclosure results can ever be assured 100 percent. If it sounds too good to be true, it usually is. The approach taken by scammers will vary, but the common denominator involves the homeowner being forced to pay upfront. Scam artists take full advantage of people’s misunderstanding of the foreclosure process, and sometimes prey on people’s denial of the situation altogether. Many homeowners don’t wake up from that denial until it’s too late. Logically, they assume that the lender would rather fi x the loan than complete the foreclosure. Unfortunately, the foreclosure process today is complicated and driven by factors that don’t necessarily make sense. An overwhelming caseload of residential foreclosures clogs the courts in Cook and Lake County, Ill., just as it does nationwide. The Cook County Court system began a new and innovative foreclosure mediation program in June, but positive results are limited by many factors beyond the control of the court systems. Courts, HUD-certified mortgage counselors, and legal aid attorneys are all stretched too thin by the huge and continually increasing volume of home foreclosures here in the North Shore suburbs and across the country. Their high caseload makes it difficult for legal aid attorneys to focus sufficient time and effort to achieve the best difficult result for each homeowner. Although courts can require mediation, they cannot dictate the outcome of mediation or require lenders to be reasonable. When the economics made sense for them, lenders entered into loan workouts with commercial real estate borrowers. They rarely do that when the borrower is a homeowner. Mortgage securitizations and the volume of defaults make it easier for lenders and servicers to complete foreclosures than to do what’s best – economically – for the lender or the homeowner. Most homeowners in foreclosure are steamrolled by the process, and the lenders later let the resale market for foreclosed homes determine their loss. That drags down all home values but allows lenders to avoid seriously considering what might be better economic solutions for the lender or the homeowner. Pushing through foreclosures, while paying only lip service to alternatives, can increase the total loss amount with additional legal expenses, brokerage commissions, and holding costs. The problem is systemic. 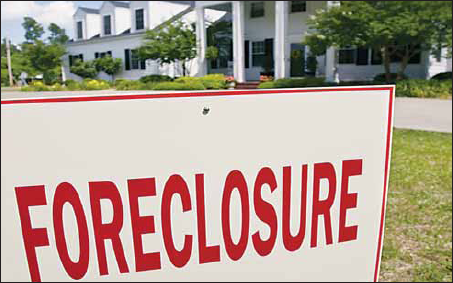 Residential foreclosure borrowers and solutions aren’t static and they’re not all the same. Most subprime mortgages have already been foreclosed. The borrowers, loan amounts, and situations are changing. Lenders have failed to recognize and address those changes, even when it would better serve the lenders’ economic interests to do so. Unless a homeowner fi nds legal grounds and vigorously defends their home’s foreclosure through the judicial process, their lender is likely to take the information the homeowner provides and give it lip service until they lose their home. If lenders would reduce the loan’s principal amount to what a home is worth, then homeowners, whose incomes have dropped, might be able to make their payments and keep their homes. Focusing on such logical solutions could save lenders money over the increased costs of foreclosure, ownership, broker’s commissions, security, repairs, and real estate taxes. Instead, people are losing both their homes and their credit. Even major Chicago-area lenders, who publicly support the Cook County Court’s foreclosure media program, try to focus responsibility for handling their mediations to loan services because they’re unwilling to practice what they publicly support. A homeowner in foreclosure – who doesn’t want to lose their home and credit – has limited options. An experienced attorney is needed to evaluate their situation and effectively represent their interests. Recognizing that homeowners in foreclosure need counsel, but may not be able to afford it, the Cook County Court’s mediation program involves legal aid attorneys. Getting their lender to reduce their loan balance is a long shot. To avoid losing their homes to foreclosure, homeowners who cannot reinstate their loan or redeem must beat difficult odds. It’s essential to determine whether or not it makes sense to try to save the home from foreclosure, what legal defenses may apply to the homeowner’s situation, and the legal strategies that may be appropriate. Sadly, many homeowners facing foreclosure wait until it’s too late, when they no longer have the money to fight the foreclosure, or it’s too late to make a difference. Contributed by Keith Collins, an attorney at keith@collinslawyer.com. Collins is a lawyer – whose practice concentrates in real estate, banking, lending, litigation, loan workouts, business transactions, and estate planning – and a member of Lawyers Connecting™, a networking and professional growth group for attorneys. This article is meant for educational purposes only and is not meant to offer legal advice and does not create an attorney-client relationship with the reader. Hire an attorney for advice. Originally published in the November 6, 2010 issue of What’s Happening! Magazine. Filed Under: Legal Tips Tagged With: Home Foreclosure, Legal Tips, What's Happening!